For those who do not visit North Campus often, and even those who do, Pierpont Commons contains a hub of resources that are worth knowing about! Built in 1965, the goal of Pierpont Commons was to help build the community on North Campus under the guidance of Wilber K. Pierpont. Not only are there great study spots and dining options available, but there are some important offices located within this building. The basement floor of Pierpont Commons offers many services including the MCard center, the Financial Aid Office, the Office of the Registrar, the I-9 Regional Center, and the University of Michigan Police Department. There are also some food options on this floor as well, including Ahmo’s, Panda Express, and Hibachi-San. Upstairs on the second floor level is Fireside Cafe, and on the first floor there is a U-Go’s, which also serves pizza. 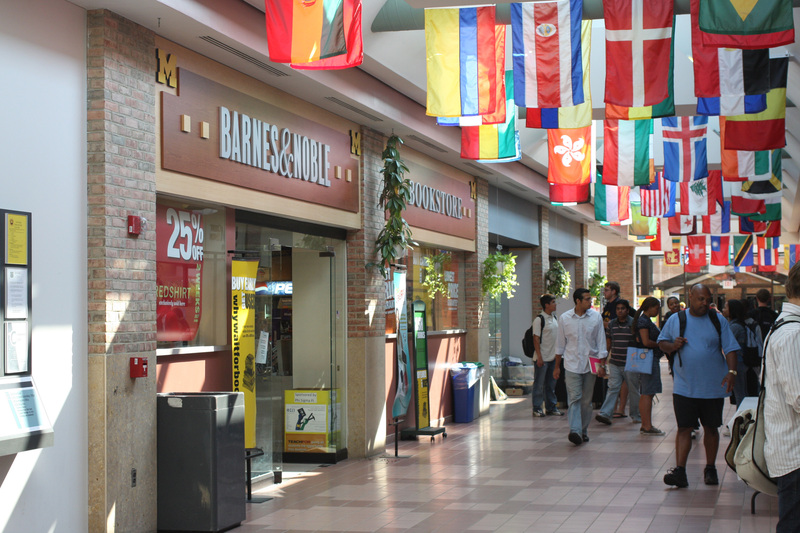 The first floor also has a Barnes & Noble bookstore, the Computer Showcase, U-M Credit Union, and ATMs. All of these shops and services, and their hours, can be found on Pierpont Common’s website. Outside of the food and services within Pierpont Commons, it also has many great study spots, which are conveniently close to the Duderstadt Library (and is connected to Pierpont Commons). There are also many computers and printers available within the building available for student use. If you need a study break, you can check out pool equipment from the Information Desk, or play on the piano that is located within the building. The building is very beautiful with an abundance of natural lighting and flags from all over the world on display. Read up on more Pierpont history and be sure to check on the building hours, as they vary each semester. Our Michigan Union location is closed while the Union undergoes renovation. Find out more at the Re:Union project site.